“Lord, you alone are my portion and my cup; you make my lot secure. The boundary lines have fallen for me in pleasant places; surely I have a delightful inheritance. I will praise the Lord, who counsels me; even at night my heart instructs me. I keep my eyes always on the Lord. With him at my right hand, I will not be shaken…. You make known to me the path of life; you will fill me with joy in your presence, with eternal pleasures at your right hand” (Psalm 16:5-8; 11). John Wesley, like many eighteenth-century Church of England clergy, had a very high view of Scripture. He understood how the early church was profoundly shaped by it and how it in turn shaped the Christian canon of Scripture. Wesley, like many of his contemporaries, believed the Holy Spirit was powerfully at work in every aspect of the formation of the Bible. For him, the people who wrote Scripture, the scribes who faithfully copied and transmitted it, and the great church councils that canonized it were all divinely inspired and directed by the power of the Holy Spirit. In short, Wesley warmly affirmed the English Reformation’s high view of Scripture. Its writing, transmission, and canonization were all done under the guidance of the Holy Spirit, and it was authoritative for the church and its people. However, Wesley’s high view of Scripture should not be mistaken for a naive fundamentalism. His many sermons and writings give evidence to his thorough familiarity with the Bible, and to its richness and complexity. He was also deeply conversant with the treasure house of biblical interpretation stretching back from his own time, through the Reformation, the Middle Ages, and to the early church fathers. As a well-educated, infinitely curious, and astutely observant man, Wesley was also acquainted with the works of Enlightenment philosophers like John Locke, Rene Descartes, and David Hume. In short, while he professed to be a “man of one book,” he was familiar with many. What marks this passage is Wesley’s deep sense of trust in God and God’s word for us. He is confident God will guide him in his reading and interpretation. When he is perplexed, he reads the text akin to what we today refer to as a canonical approach, “search[ing] after and consider[ing] parallel passages of Scripture.” And “if any doubt still remains,” he turns to the wisdom and guidance of Christian ancestors, believing God will use their interpretations of a text to enlighten his own understanding of it. He trusts that God will, through the presence of the Holy Spirit, illumine his understanding. And he is confident that illumination will be in conformity with what the church has taught in all time and all places, rather than some novel or esoteric insight that would lead him and others astray. For Wesley, the Bible was the pathway to God, the way of salvation. For that reason, it was completely worthy of his trust and the trust of others. In his preface to notes on the New Testament, Wesley writes: “The Scripture therefore of the Old and New Testament, is a most solid and precious system of Divine truth. Every part thereof is worthy of God; and all together are one entire body, wherein is no defect, no excess. It is the fountain of heavenly wisdom, which they who are able to taste, prefer to all writings of men, however wise, or learned, or holy.” There is no evidence to suggest Wesley ever deviated from his high view of Scripture. For most of the first 150 years of American Methodism, Wesley’s high regard for Scripture profoundly shaped the way nearly all Methodists read the Bible. This is not to deny the influence of other interpreters, but only to acknowledge that there was no serious attempt to challenge, alter, or even substantially enhance the Wesleyan way of reading the Bible. However, with the rise of an increasingly college-educated and seminary-trained clergy in the later 1800s and early 1900s, other ways of reading the Bible began to influence the church. At least initially, these interpretive strategies were not taught with the intention of challenging the Wesleyan way of reading and interpreting it. The aim was to equip clergy with a better sense of the historical and cultural contexts of ancient Israel and the early church and the way historical and cultural currents shaped the writing, transmitting, and ultimately the canonization of Scripture. 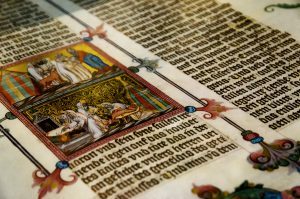 Increasingly among seminary-trained clergy, historical-critical methods for reading the Bible began to supplant the Wesleyan approach we have outlined above. Many pastors attempted to employ these methodologies to help broaden the laity’s appreciation of the Bible’s background. In faithful and skilled hands, this approach has helped illuminate the biblical world and deepen people’s understanding of and connection with the faith of the ancient Israelites and early Christians. But just as often, sermons steeped in these methods sound like dry history lectures. At their worst, they cast doubt on some of the church’s core doctrinal confessions like the virgin birth of Christ and the Resurrection. To this day, some United Methodist pastors continue to lean too heavily into these biblical interpretive strategies for constructing a sermon, giving little attention to the marvelous, mysterious, and wonderful ways God seeks to redeem his people through Jesus’ death and resurrection. With the creation of The United Methodist Church in 1968, prominent church theologians saw an opportunity to articulate an approach for discerning God’s will that respected Wesley’s high view of Scripture, yet was also more contemporary and intellectually sophisticated. Albert Outler, a leading United Methodist theologian, championed the idea of the “Wesleyan Quadrilateral,” that is, the utilization of Scripture, church tradition, reason, and experience to discern God’s will for his people, both corporately and personally. Although Wesley never used the term quadrilateral himself, Outler maintained that the approach faithfully systematized what Wesley implicitly practiced. Before long, Outler himself recognized the word quadrilateral was an unfortunate choice. It implied all four approaches for discerning God’s will were equally valid and therefore should be equally weighted, whereas (as Outler recognized) Wesley always regarded Scripture as the primary source of authority. Furthermore, some clergy, and consequently some laity, substituted a modern understanding of the term experience for what Wesley had in mind. To be fair, Outler and other Wesleyan scholars understood “experience” as Wesley himself had understood it. But in the late 1960s and early 1970s, it was easy to assume “experience” was all about one’s broad, personal experiences of life, rather than Wesley’s conception of the vivifying experience of the Holy Spirit working in one’s life as God’s grace justified and sanctified a believer. Outler and other Wesleyan theologians rectified the error, but not before serious damage was done by those who found freedom in the idea that tradition, reason, or experience could just as easily lead the way in discerning God’s will as a reliance on Scripture. Such an idea runs counter to a critically important section of the Book of Discipline called “Our Theological Task.” In that section of the Discipline, the categories for discerning God’s will – Scripture, tradition, reason, and experience – are carefully explicated, but the term quadrilateral is never used, and the emphasis clearly falls on the primacy of Scripture, with the other avenues feeding into the royal road of God’s word (Book of Discipline; para 105). Although this approach has received learned and trenchant critical evaluations, it remains the accepted means for discerning God’s will among United Methodists. For all its problems, it provides a faithful framework for affirming The United Methodist Church’s core doctrinal convictions about Scripture, the Triune God, creation, humankind, God’s mighty acts of salvation culminating in Jesus’ death and resurrection, and the vivifying power of the Holy Spirit at work in the church catholic. Furthermore, the approach simultaneously provides necessary boundaries, but still plenty of room for further theological reflection as the people of the church attempt to live faithfully in their own time and place. In recent years, there have been explicit and implicit attempts to significantly modify or even supplant the Wesleyan approach to Scripture. One of the approaches to Scripture that bears some consideration is the interpretive strategy proposed by Adam Hamilton in his book Making Sense of the Bible. While his proposal is not necessarily a new one, it is important to consider it given Hamilton’s influence in The United Methodist Church. He is the pastor of the largest United Methodist church in the United States, a leader in the centrist movement, and many of his books are widely read. The approach Hamilton describes is not intended to replace Wesley’s or anything outlined in the Discipline regarding the primacy of Scripture. Although he never states it explicitly, one gathers he believes his proposal merely augments the others. It is also influenced by the positivistic tendencies of historical criticism and – surely unwittingly – it bears some resemblance to a second-century interpretive approach that was ultimately rejected by orthodox Christianity. “As we read and interpret scripture, I’d suggest that there are three broad categories – let’s call them buckets – that biblical passages fit into. There are passages of scripture – I would suggest the vast majority – that reflect the timeless will of God for human beings, for instance, ‘Love your neighbor as you love yourself.’ There are other passages that reflect God’s will in a particular time but not for all time, including much of the ritual law of the Old Testament. And there are passages that reflect the culture and historical circumstances in which they were written but never reflected God’s timeless will, like those related to slavery” (emphasis original). On first blush, Hamilton’s “buckets” seem like a helpful and practical way of separating the wheat from the chaff. But on closer inspection, it is clear his approach to Scripture is antithetical to Wesley’s and a significant departure from what is outlined in the church’s Discipline. It also raises at least as many questions as it answers. For example, who is the final arbiter of what passages go into which buckets? What are the criteria for determining which verses, chapters, and books go where? And what comes of those portions of the Bible tossed into buckets two and three? Hamilton evidently believes he and other modern readers are equipped with the tools to do the sorting (presumably historical-critical tools aid the reader in this endeavor), and once it is done they will be left with a pristine collection of stories, sayings, and commandments that reflect God’s true will. Hamilton takes Scripture seriously and recognizes it is difficult and disturbing at times, which is laudable. However, were people to follow his approach, it would lead to the virtual excision of parts of the Bible. Who but historians and antiquarians would continue to regularly read Bible passages “that reflect[ed] God’s will in a particular time but not for all time,” let alone ones that “never reflected God’s timeless will”? His buckets metaphor is an inadvertent invitation to cease reading some parts of the Bible. Although Hamilton fails to acknowledge it, the practical effects of his approach would be similar to other approaches that have been tried before. In the mid-second century, Marcion, a wealthy ship builder and convert, became convinced Christians should reject the Jewish Scriptures as well as most of the books and letters that now make up the New Testament. For him and his followers, only the Gospel of Luke and a handful of Paul’s letters were the inspired and authoritative word of God (that is the God of Jesus, not what Marcion saw as the “god” of the Jews, which he regarded as a malevolent force). The early church rejected Marcionism and it eventually died out as a movement. Centuries later, Thomas Jefferson, a true son of the Enlightenment, was so confident in his ability to identify the true sayings and deeds of Jesus that he took a penknife to the Gospels. He extracted only those sayings and deeds he was convinced Jesus truly said and did and then pasted them into a very thin volume he called The Philosophy of Jesus. Writing to a friend about his project, he said it was like “extracting diamonds from a dunghill.” Jefferson’s regard for the writers of the Gospels was not high. He referred to them as “unlettered and ignorant men” given to “superstition” and “priestcraft” (a backhanded way of criticizing both the Gospel writers and the leaders of the Roman Catholic and Anglican Churches). And in recent history a number of New Testament scholars from leading universities and seminaries participated in the Jesus Seminar project. Together, the participants read through the four Gospels and voted on the authenticity of the recorded sayings and deeds of Jesus. They used four different colored beads to rank their confidence, or lack thereof, in the Gospels writers’ ability to truly capture Jesus’ actual words and deeds. To be sure, Hamilton’s strategy for interpreting the Bible stops well short of these extreme approaches. But he gives no indication in his book that he is aware of how his proposal, if taken too far, could lead to similar results as those advocated by Marcion, Jefferson, the Jesus Seminar, or others who have proposed expunging, cutting, or sorting out the Bible. Consequently, he fails to contend with the legitimate questions and critiques such unorthodox approaches have encountered. His “buckets” proposal inadvertently invites Christians to sit in judgment of the Bible rather than the other way around. Wesley and many interpreters before and after him have been aware of the difficult and even repugnant passages we find in the Bible, but in keeping with orthodox church teaching they have never proposed explaining away or discarding portions of the Bible. They, and many contemporary biblical scholars, would be troubled by Hamilton’s confidence in our ability to sort Scripture into three buckets, two of which we can effectively discard. What Hamilton regards as a means of biblical interpretation actually subverts biblical authority. Most Christians know this is way too easy and wide open to abuse. Who among us would not, on occasion, like to toss into Hamilton’s second and third buckets a particular biblical story, commandment, or saying that convicts us? The human heart, as both the Bible and experience teaches us, is inclined to self-justification in order to get what it wants. At one time or another we have all watched and winced as otherwise faithful people have engaged in biblical interpretive gymnastics in order to justify their actions. And if we are honest with ourselves, we are as prone as they are to do the same. While Hamilton’s proposal is well meaning, it is antithetical to Wesleyan and orthodox approaches to Scripture. Nevertheless, some UM pastors and laity confidently regard it as a valid approach to reading and interpreting the Bible. Consequently, they often argue that our differences are not about the authority of the Scripture but only about its interpretation. That is simply not true. When some United Methodist pastors assert that some parts of the Bible never were truly God’s word, that is not a statement about the interpretation of the Bible, but about its inspiration. Their view differs greatly from Wesley’s statement that “Every part thereof [ScriptureJ is worthy of God; and all together are one entire body, wherein is no defect, no excess.” It is an understanding of Scripture that cannot be reconciled with the Apostle Paul’s belief that “all Scripture is God-breathed and is useful for teaching, rebuking, correcting, and training in righteousness” (2 Timothy 3:16). We all struggle to understand how God inspired the Bible. None of us are fundamentalists who believe God dictated it, bypassing the knowledge, experiences, and personalities of its human authors. We do not believe God turned human beings into mindless keyboards whom he employed to bang out his word. How the process of inspiration worked is mysterious, and we all wrestle with what it means to have the word of God communicated to us in the words of human authors. Nevertheless, the United Methodist Church affirms the view of Paul and Wesley that the Scriptures are fully inspired and authoritative for us both corporately and personally. We stand with the early church and with the church universal that Scripture was inspired by God and that we must stand under its authority. The United Methodist Church’s teachings on Scripture may be wrong, and liberal approaches such as these practiced within The United Methodist Church may be right. But we need to be honest and admit that on the very important issue of Scripture’s authority and inspiration, we are not together. So given the very different ways United Methodists interpret the Bible and think about the authority of Scripture, the question still remains: Are we better together? Walter Fenton is an ordained elder in The United Methodist Church and the vice president for strategic development for the Wesleyan Covenant Association. This essay is adapted from Are We Really Better Together? by Walter Fenton and Rob Renfroe (Abingdon 2018). This excerpt published from that book with permission. There is a difference between God’s will and God’s word. Said another way, we might acknowledge that there is value to the words in the Bible that seem to support slavery (to use Hamilton’s example) and thus God intended for those words to be in the Bible without also saying that those words represent God’s will for us or other people. It may be subtle, but it is important. This is particularly true given the next paragraph. Fenton attempts to distinguish between a plenary inspiration and a non-plenary yet “fully inspired” view. Did God write the words about slavery or not? If God did not write them with humans as “mindless keyboards” then Fenton himself has opened the door to precisely what Hamilton is contending. The Spirit works throughout Scripture, even in passages about slavery or Psalms calling for violence, and they are thus God’s word but those passages do not reflect God’s will. In the 21st century our understanding of “slave” is in the context of the British Empire, The Colonies in America, The Cotton Trade of the Southern United States, The Textile Industry of The Northern United States and The Civil War between The States. In the first century a “slave” may have had a different context within the social order. When Paul advises slaves to be loyal to their masters the understanding of slavery was in an entirely different context. Paul did not want to disrupt the society with a slave uprising, but rather have free and enslaved persons teaching and learning “The Way”, or Christs teachings and salvation. The Cotton Trade and slavery in the colonies and The States was in need of change because of its dehumanizing and exploitive nature.